That looks delicious. So the "more cooked" duck was smoked for 4 hours? Did you collect any melted fat? I bet the smoke flavour in the fat would be nice. What kind of ducks are these, by the way. Your bacon post convinced me to get a WSM. Still debating on the 18.5" or 22.5" that are now available. Thanks Rhea. Yes, we smoked the more fully cooked bird "around 4 hours," at "around 215 degrees," but it wasn't much longer than the first. 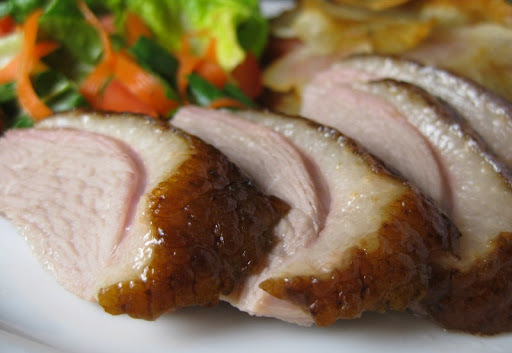 We're not sure why they cooked so differently - maybe because of the types of ducks (we need to keep experimenting). We got the first one at an Asian market (Ranch 99) and the second was a frozen "duckling" from our local natural-foods grocery store (Henrys), so I'm not sure what breeds they were. I didn't keep the fat specifically, but I made smoked duck stock from the carcass - it's great as a soup base. We love our little WSM. I don't think you can go wrong with either one - we're space constrained, so the smaller one works better for us. But if you have the room, the bigger one would be nice. Go for it, and have fun! absolutely gorgeous! 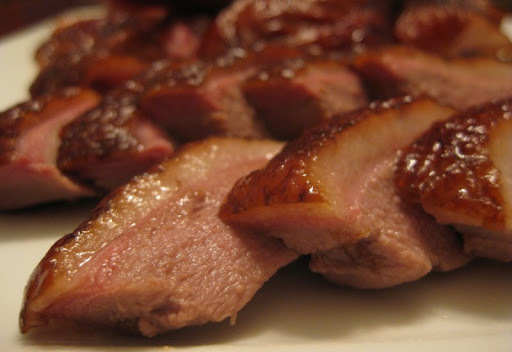 i've seen smoked duck prepared on one of the Gourmet "Diary of a Foodie" episodes, and since then i've been craving it. welcome back, craving. Both ducks are beauties...I love all things smoked, I should do more of my own. Mike that looked great. 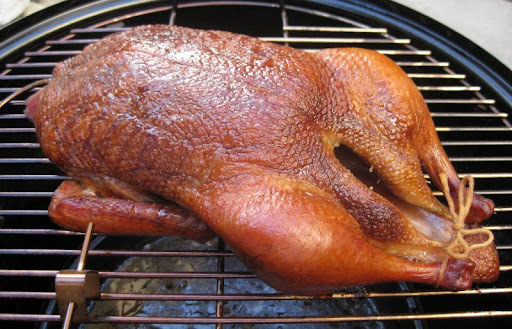 Typically I throw duck on the rotisserie, but it looks like I may have to try smoking. Thanks, guys! Our smoker was definitely a good investment. Our rotisserie has gone neglected recently - we need to put it to use again soon. Oh man that looks amazing! I wish I had a yard to get a smoker. I've been thinking about trying to do the stove top variety employing sugar and tea leaves, but haven't yet due to concerns about setting off smoke alarms in our building. I've heard about tea-smoking, but we've never tried it. I would imagine that it would give a more mild smoke flavor. I want to try the same with my stovetop smoker. Any tips from anyone? I have an apartment gas stove, so nothing fancy and a cast iron stove top smoker. My big worry is the fat dripping onto the woodchips and the resulting flareups causing a burned flavor in the bird. 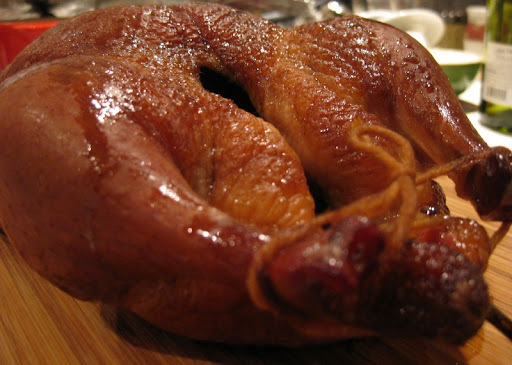 simonal - we've never done it, but I've heard of people doing tea-smoked duck on the stovetop. I think they generally do it in a bamboo steamer. What spices did you use? Did you marinate the bird? Do you have the recipe? Yes - we brine the duck. As for a recipe, it has evolved as we've done it each time. Next time we do it, we'll pull together a recipe. Excellent - I have a WSM and I now have a duck in the fridge, and the weekend (in London) is going to be great. I just found your site whilst searching for Smoked Duck - brilliant site. Quick question. 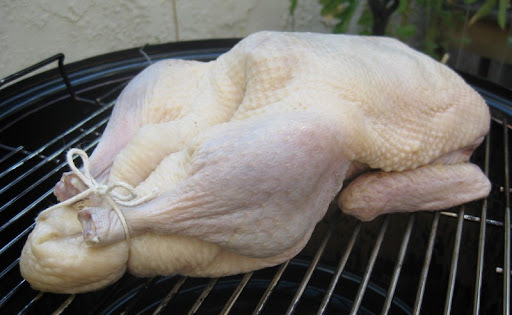 Do you think the brining is necessary? I read on the http://www.virtualweberbullet.com/brining.html that it's not necessary for Duck. Hi Steve - glad you are enjoying the website! I wouldn't say that brining the duck is necessary, but it has definitely worked well for us.